Using the following portals is free of charge. enables managers and owners of small enterprises to run bookkeeping, manage invoices and account for inventory management, as well as record emails and other documents. With an Internet connection and an active account You can always have your data and documents at hand, regardless of time, date and location. or business managers and owners. Madar 7 is Poland's largest ERP system, built dual technology - offering a unique opportunity flexible switching between two operating modes: remote (via internet connection) and local. Includes a fully compatible modules: ERP, warehouse, accounting, payroll, personnel, office, crm. MRP - settlement of production, production orders, recipes, production plan. Client panel - partners: check balances, order status. Madar is a development software company for business and non-profit organisations, operating on the Polish market since 1991. We have concentrated mainly on creating programs that support management companies. Our strength is experience in software solutions for small and medium enterprises: for administrative, bookkeeping, payroll and CRM. Above all, we have over twenty years of experience, skilled staff and good service and support. 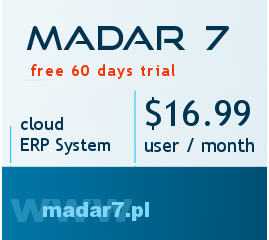 The main product Madar 7 (http://madar7.pl) is a comprehensive ERP software, is offered as hosted (cloud based) and on-premises for small and medium-sized enterprises. Besides, we offer our customers the opportunity to conduct the sale and settlement of the warehouse, invoicing and management documents on our our portals: invoicer.biz, madar.mobi, docum.pl.